Lower Duden Waterfall is 8 km far from the city center close to Karpuzkaldiran Beach on the way to Lara. Duden Creek creates this marvelous waterfall and its drop height is greater than the upper waterfall, falling from about 40 m into the sea in amazing water clouds. The panorama looks like a painting when looked through the Genclik Park right beside. If you have a chance, we advise you to watch the falling waters from a boat out at sea. The peaceful sounds of the water splashing against the rocks at Duden Waterfalls are just one of the everyday luxuries you experience in Antalya. To enjoy a cool day in Antalya and also see a wonder of nature one should go to the Dudenbasi waterfalls. 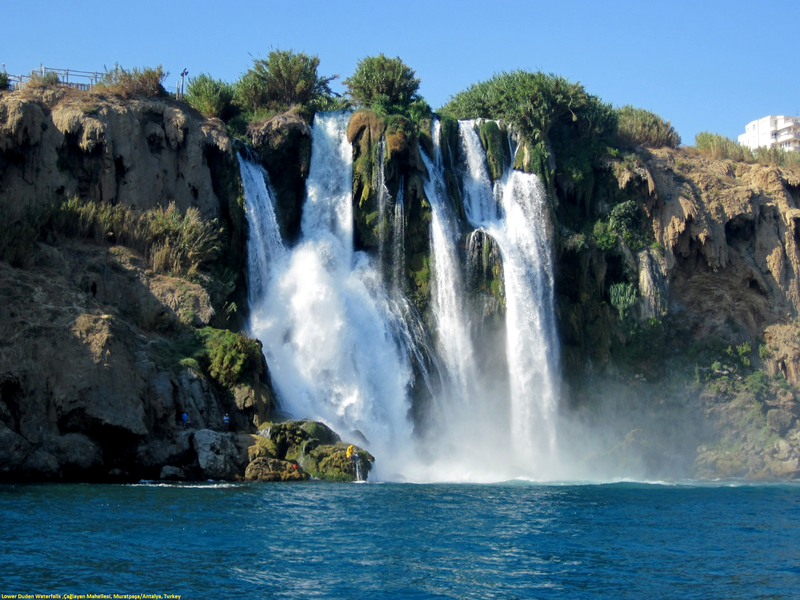 The Duden Waterfalls and the picnicking area around it attract both people from Antalya and guests from outside. The distance to the Duden park from downtown Antalya is about 8 kilometers, you can take a bus or to go by taxi.The park occupies the last two kilometers of the river and gardens along both banks we offer a very relaxing ride. On reaching the vicinity of the waterfall there lookouts to enjoy the views. On the right side, the cliff goes a little deeper into the sea, so the waterfall can be seen very well from there. Like elsewhere in the country, despite the handrails and guards, we must be careful with children. The second possibility to enjoy the falls is to take one of the boat tours departing daily from the Old Port. There are various times and prices, may be a good idea for a walk the day before to inform and choose what suits your plans. Some tours include a stop along the way to swim in the many caves under the cliffs. The refreshing waters of the Turkish Mediterranean are a powerful attraction in the summer months. The journey takes just over an hour, more time to stop for the bathroom. It is impressive to see the cliffs of the east side of Antalya from our boat. At the top there are buildings and hotels that are literally hanging on 30 meters above sea. In some places there are platforms on the rocks where you can sunbathe and ladders also have access to water for swimmers.